This was a project carried out by me, Eva Schindling and Gesa Friederichs-Büttner spring 2006. We decided to build a database out of the local newspaper GP. By saving one "Göteborgspost" every day for a month we got enough material to create our own headline. We made up some simple rules for the cut'n paste technique to create the headline. 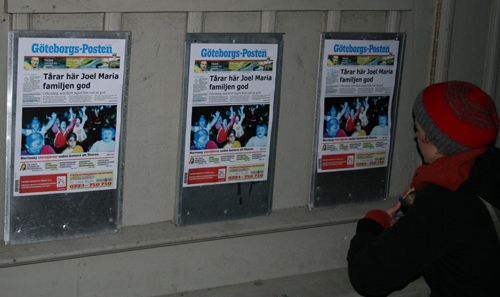 One windy night we made the action, hanging up the our version at several places in the city of Gothenburg.